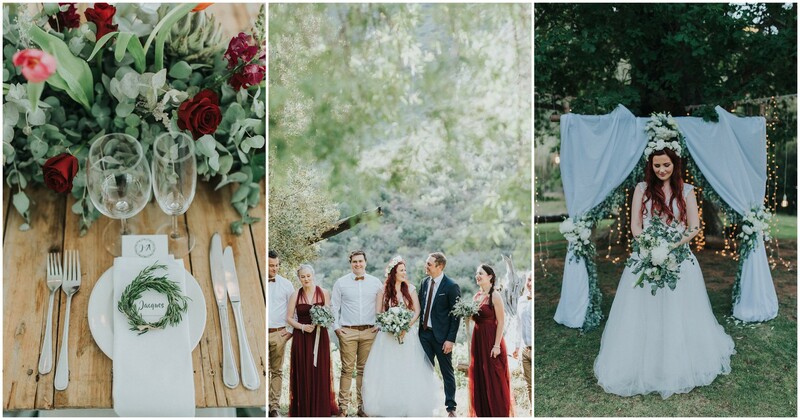 Anid and Johan’s stunning outdoor mountain wedding in Robertson at Pat Busch Mountain Reserve was a weekend-long celebration of love and family. 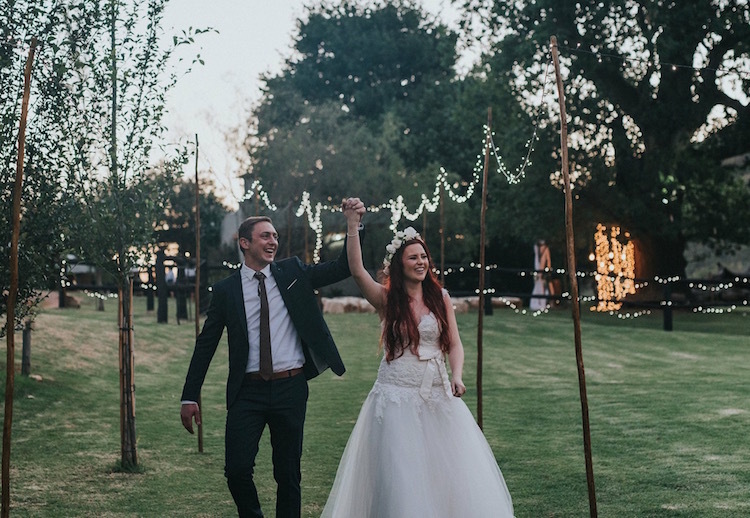 Most of their guest travelled to the Klaas Voogd’s Meander near Robertson in the Western Cape from afar, so the couple searched for a venue that would allow their guests to spend the weekend. 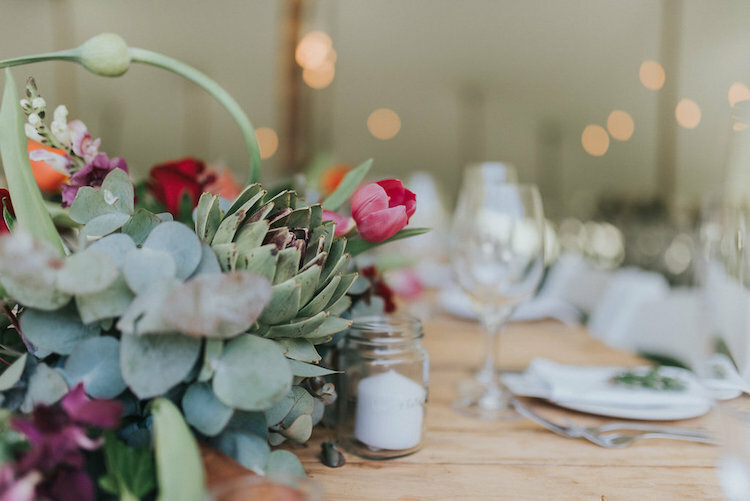 The couple wanted a South African-style country look-and-feel for their wedding reception, which they held in perfectly lit bedouin tent. The tent was pitched on a meadow with an amazing view into the valley surrounded by majestic mountains. 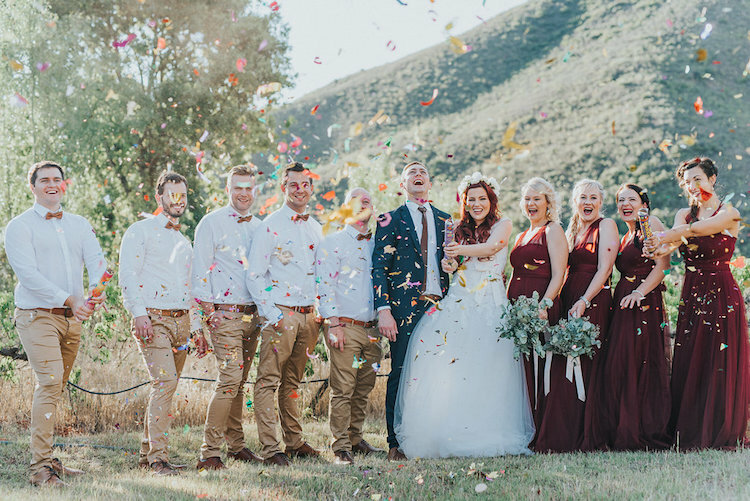 Tones of maroon, pink and white adorned their unmissable celebration, photographed by Debbie Lourens. Love Story: We met at a social event at Johan’s work. I was immediately intrigued by this tall, handsome man with the deep voice. As he was incredibly shy, I knew that I would have to make the first move, so I gave him my phone number and invited him to join us at another event later. Two months after we started dating exclusively. Anid’s bridesmaids all wore long, flowing maroon dresses made by Gelique in Pretoria. The colour of her hair was the inspiration for the choice of the maroon colour. 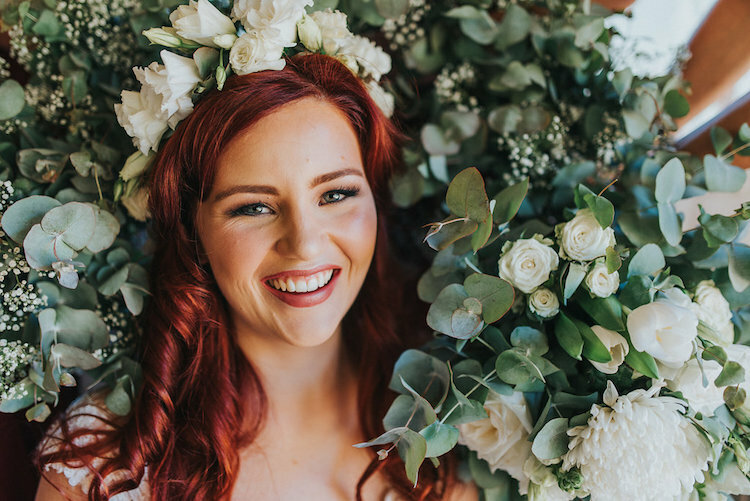 Her bridesmaids all had long hair: the maid of honour’s hair was styled in a side bun, and the other bridesmaids all wore their hair in a side fishtail braid. 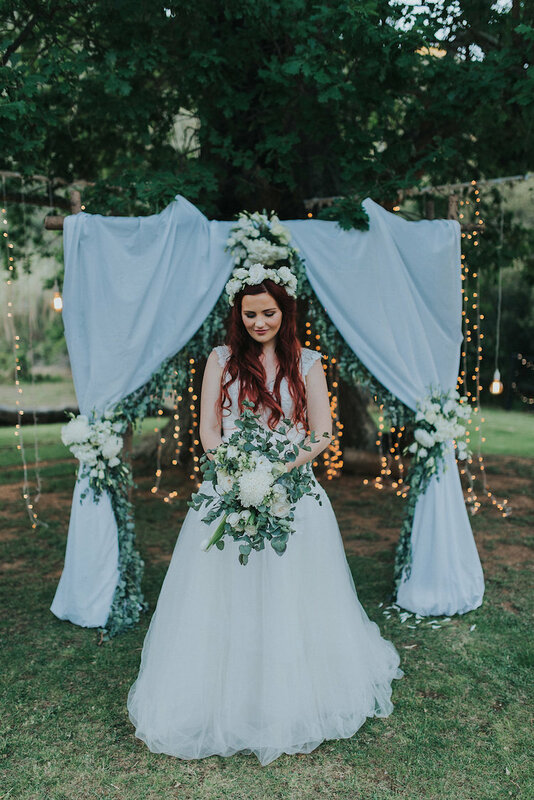 Anid had plain white flowers for her bouquet with some eucalyptus penny gum leaves surrounding the flowers. Her bridesmaids’ bouquets consisted of penny gum with some gyps (baby’s breath). 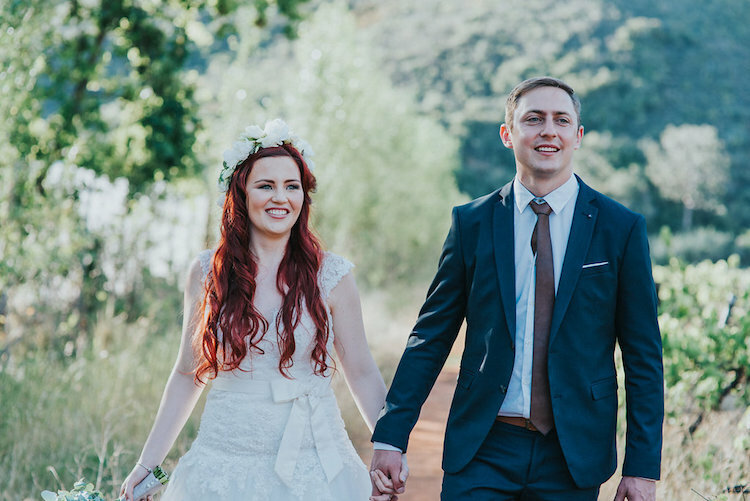 Anid’s fairy tale wedding dress had a dropped waist, a bodice of Chantilly lace with fragile lace straps and a row of buttons and loops at the back. The 10-layer tulle skirt was finished off with a satin belt with a big bow. Anid’s dashing groom, Johan, wore a form-fitting navy blue suit from Zara. A special touch was the tie that his brother/ best man gave him with his late father’s favourite bible verse engraved on the back. 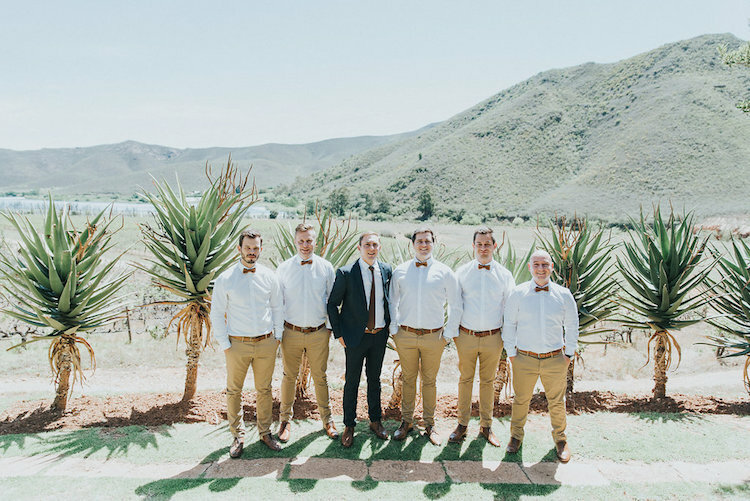 The groomsmen wore plain white shirts with khaki pants and brown shoes. They all had matching bow ties. 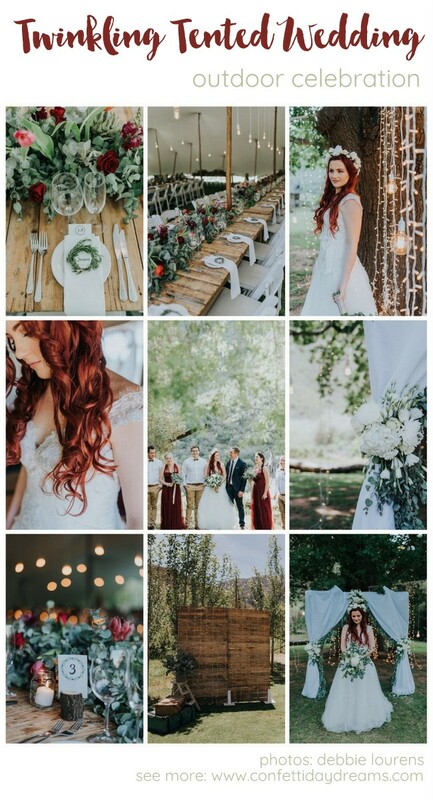 Their stunning outdoor mountain wedding ceremony took place under the Old Oak Tree overlooking the meadow and with a view over the valley. 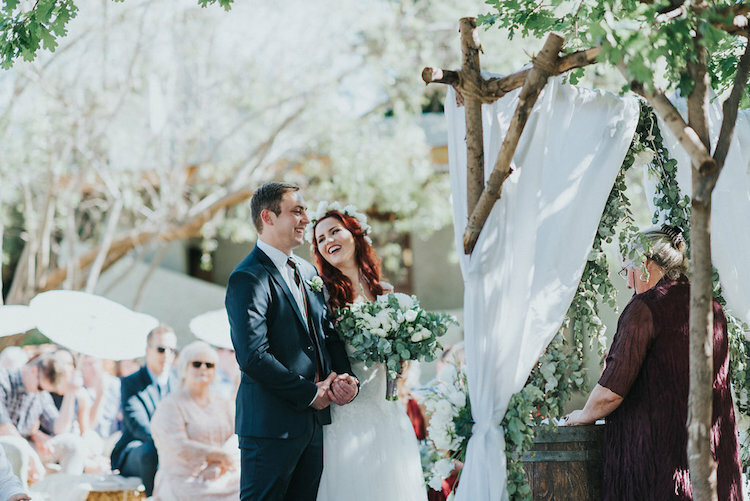 They were married under a rough wooden arch that was covered with white draping, white flowers and greenery at the wedding ceremony. 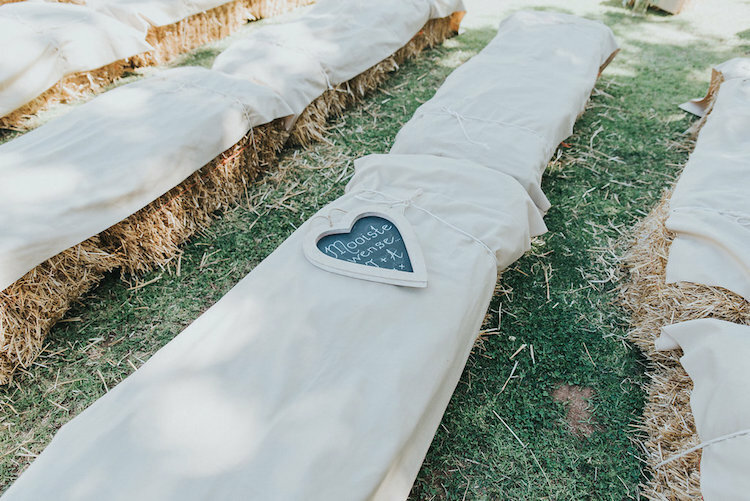 The aisle was lined with white flower arrangements and the guests were seated on hay bales covered with white cloth. 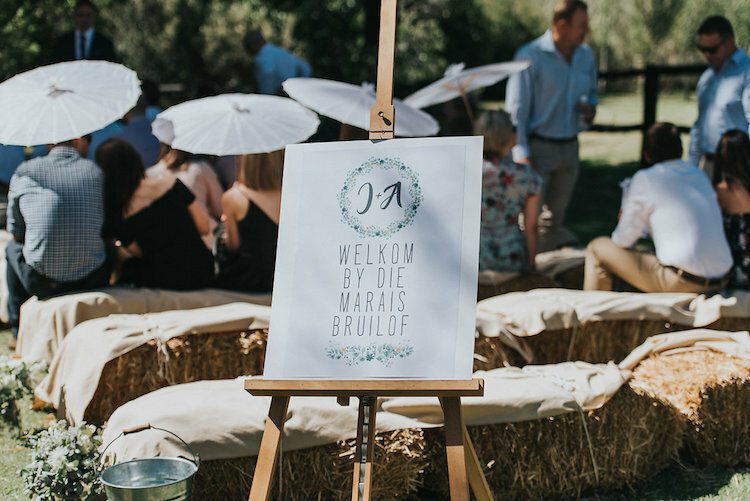 There were customised bottles of water in a barrel of ice and umbrellas to keep the guests cool. When their wedding ceremony started, each of the bridesmaids walked down the aisle individually, follow by Johan’s two young nieces, their flower girls. As Anid walked down on her dad’s arm, the first thing she noticed was her handsome groom waiting for her in front of the arch. The ceremony was conducted by Johan’s mom which made it all the more special. 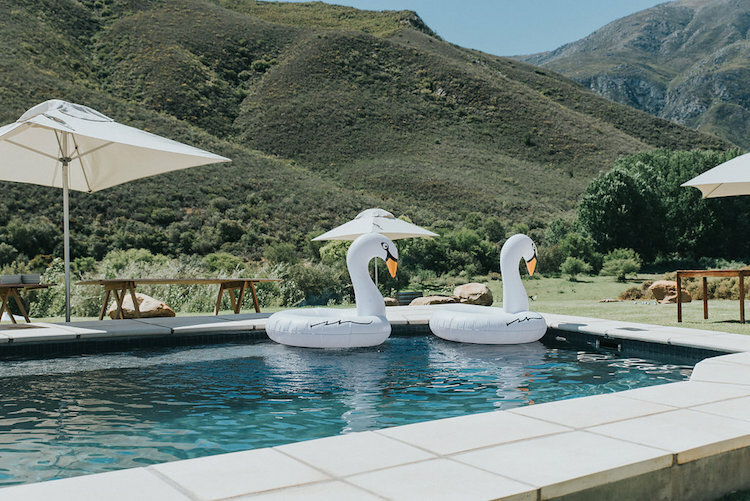 Immediately after the wedding ceremony the guests could enjoy canapés next to the swimming pool. 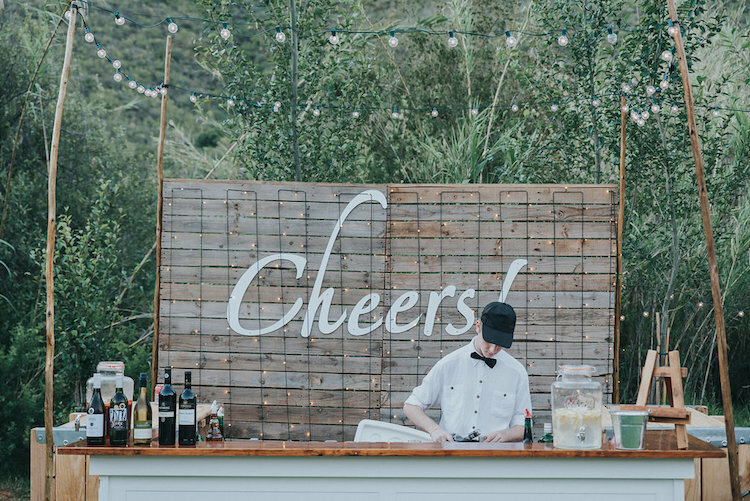 There was champagne, craft beer on tap, slush puppies and more. The guests entertained themselves with lawn games. As a special gift for their guests, the couple hired a caricaturist to make a pencil drawing of their guests while everyone was seated on a special Pink Floyd Couch. Each guest’s drawing was put into a cardboard graduation tube. 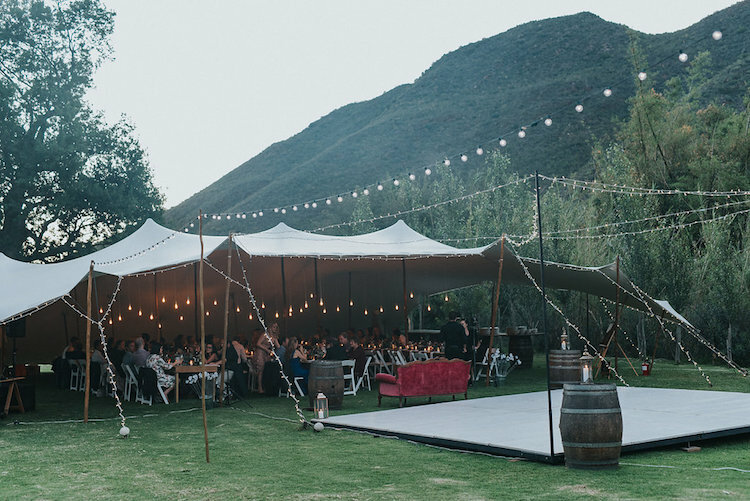 Their outdoor mountain wedding reception in Robertson took place underneath a bedouin tent on the meadow overlooking the kloof. Naked globes hung over each table. 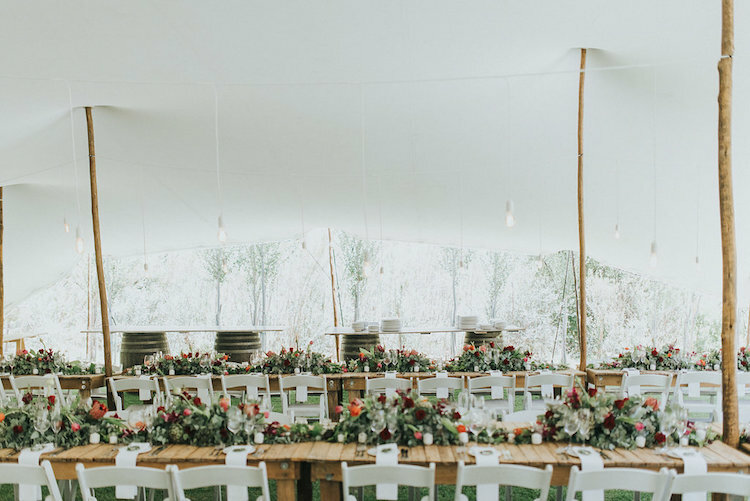 There were three long tables in the tent with hundreds of candles on the tables including votives in mini-Consol jars and tea lights in tea light holders, creating a magical atmosphere. 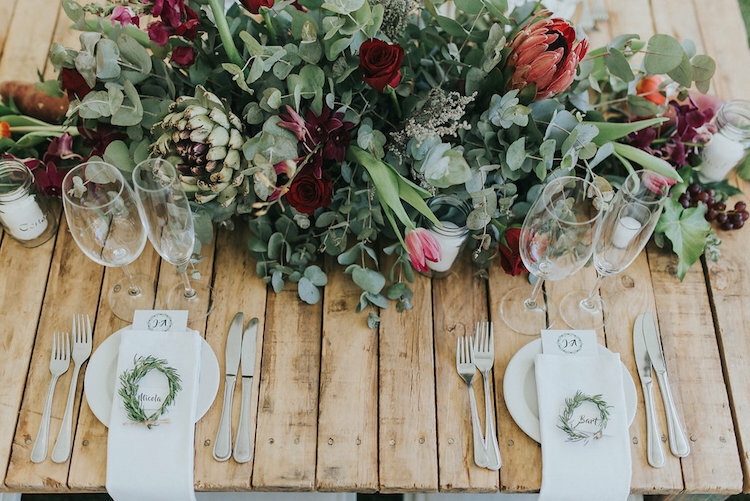 Their wedding reception flowers were arranged in one long arrangement in the middle of the table and consisted of dark red and pink flower in a sea of greenery. 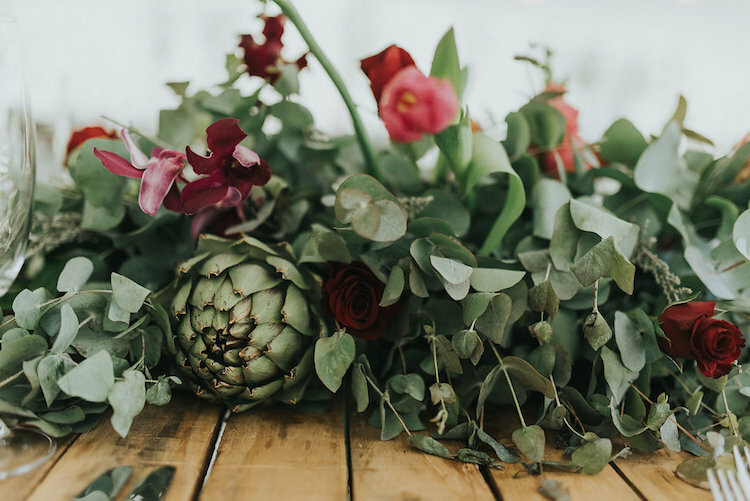 There were proteas, tulips, roses, artichokes, orchids, onion flowers and snapdragons. 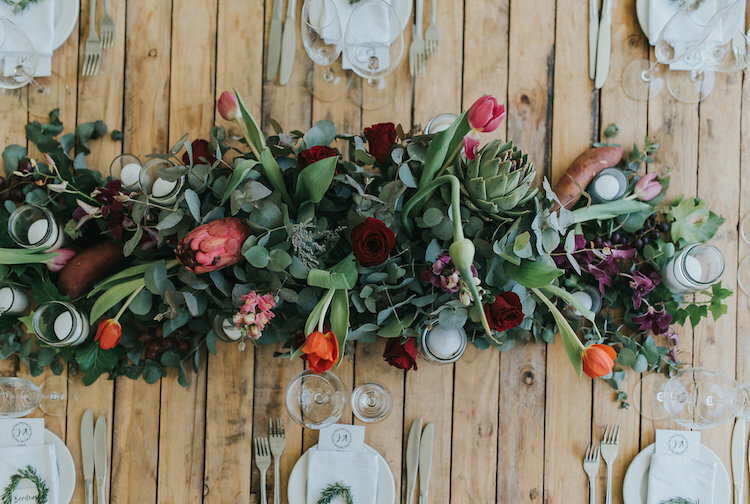 The arrangements were surrounded by bunches of grapes, sweet potatoes and aubergines. Johan made their wedding seating chart out of pallet wood. The guests’ names were printed on old school package label tags and then tied to a rope and draped under each table number. 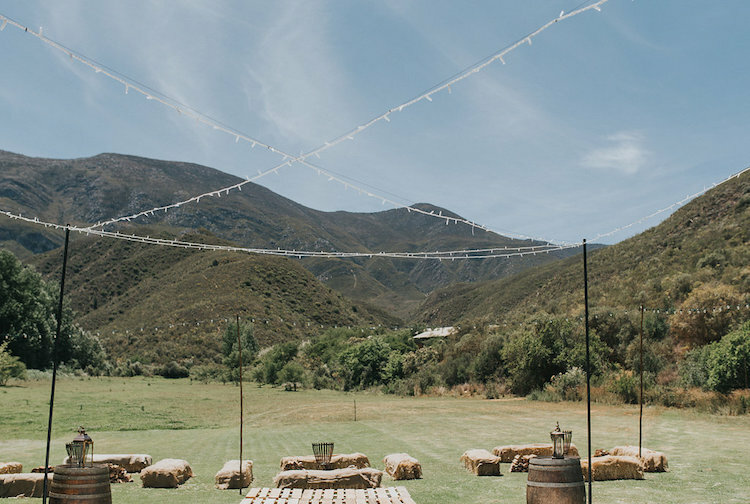 Their outdoor mountain wedding reception featured a dance floor just outside the tent, underneath the stars, covered with strings of fairy lights. Each corner of the dance floor had a French oak barrel with a large lantern on it. There were three large bonfires on the sides surrounded by hay bales where the guests could sit. The bar and the stop-motion photo booth were also just outside the tent. 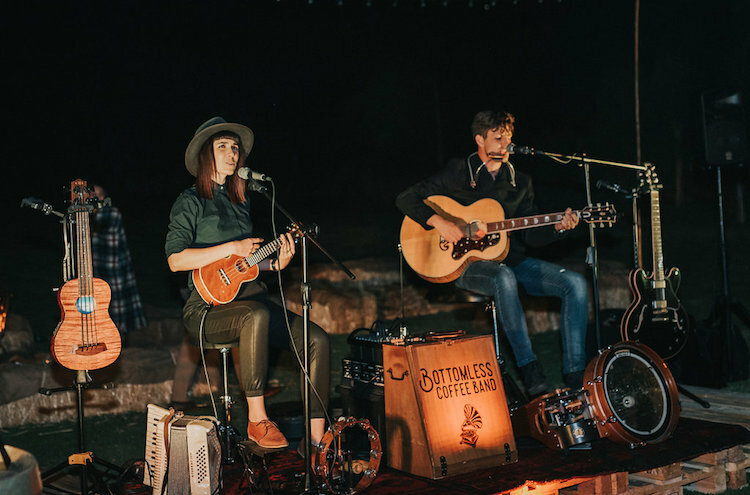 As a special surprise for their guests, the couple had their favourite South African band, Bottomless Coffee Band, entertain their guests. “We danced and partied the night away. It was truly a magical celebration under the stars. Be very specific with your service providers and explain to them exactly what you expect from them. Make your own playlist and request that your DJ play your playlists. 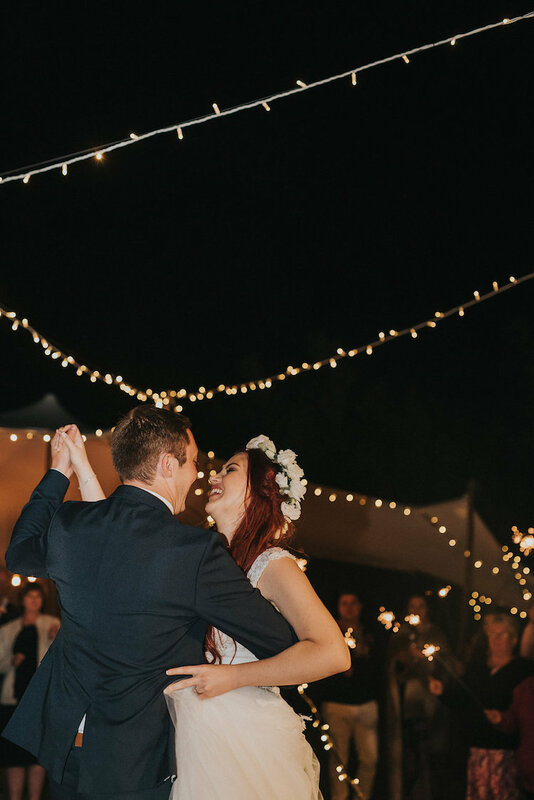 Choose a wedding venue that will allow you to continue the celebration till later and not force you to stop the music at 12 o’clock.